The Digital Renaissance | gURROO - A new generation of innovative minds. Either agricultural civilization, industrial one, or informational society solely lead to the humanity crisis. Is there anything that could symbiotically combine them altogether with the “medium”? 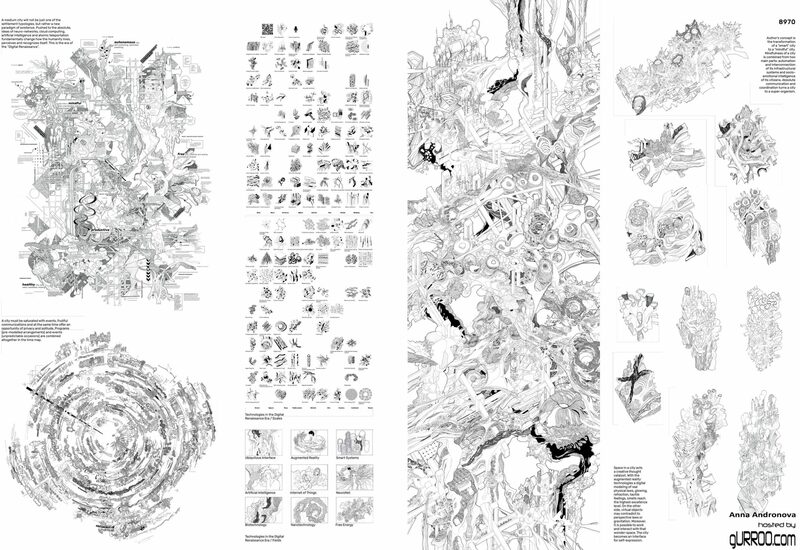 A medium city will not be just one of the settlement typologies, but rather a new paradigm of existence. Pushed to the absolute, ideas of neuro-networks, cloud computing and artificial intelligence fundamentally change how the humanity lives, perceives and recognizes itself. This is the era of the “Digital Renaissance”. Author’s concept is the transformation of a “smart” city to a “mindful” city. Mindfulness of a city is combined from two main parts: automation and interconnection of its infrastructural systems and socio-emotional intelligence of its citizens. 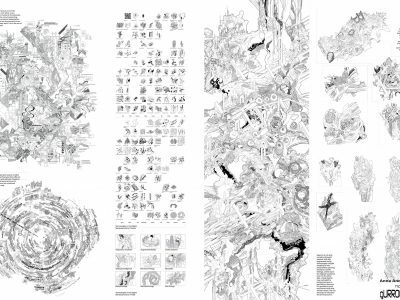 Absolute communication and coordination turns a city to a super-organism. 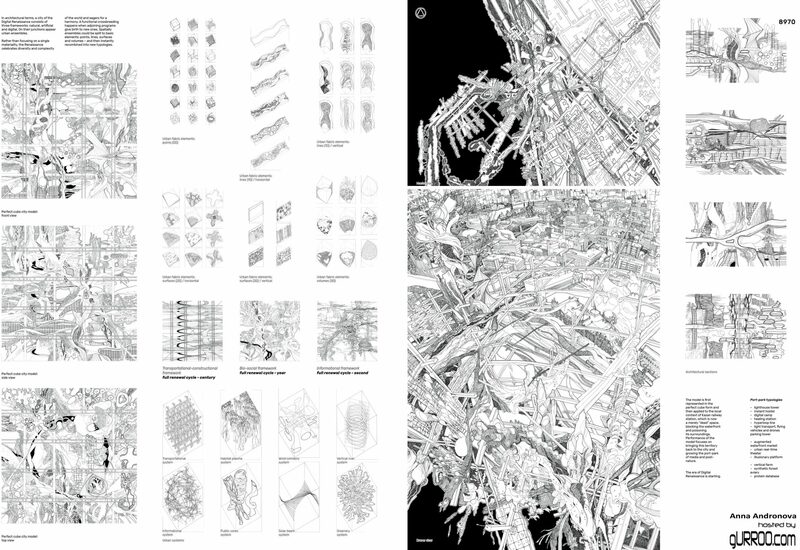 Space in a city acts a creative thought catalyst. With the augmented reality technologies a digital modeling of real physical laws, glowing, refraction, tactile feelings, smells reach the highest excellence level. On the other side, virtual objects may contradict to perspective laws or gravitation. Moreover, it is possible to work and interact with that wonder-space. The city becomes an interface for self-expression. 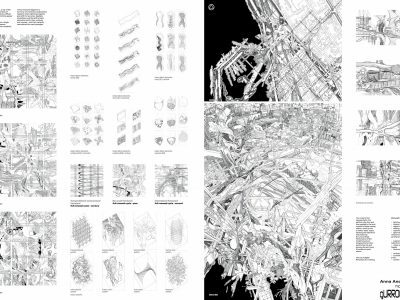 In architectural terms, a city of the Digital Renaissance consists of three frameworks: natural, artificial and digital. On their junctions appear urban ensembles, which spatially could be split to basic elements: points, lines, surfaces and volumes. Rather than focusing on a single materiality, the Renaissance celebrates diversity and complexity of the world. The model is first represented in the perfect cube form and then applied to the local context of Kazan railway station, which is now a merely “dead” space, blocking the waterfront and poisoning its surroundings. Performance of the model focuses on bringing this territory back to the city and growing the port-park of media and post-nature. The era of Digital Renaissance is starting.